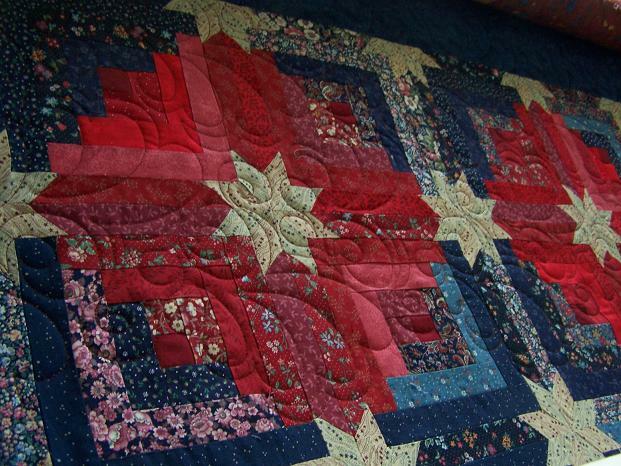 I started the quilting on my Starry Log Cabin. I’m using Hermione Agee’s (Lorien Quilting) Fantasia panto. Let me tell ya, I am LOVING this one. I’m so excited about how pretty it is stitching up. Here’s some sneak peeks…it’ll be a few days before I have it finished. I only have four rows done, it’s an eleven inch panto, my top is 115″, so I have a ways to go yet. (yes, I’m sure that’s not “proper” English, but it’s how I talk…so if I want to write that way, too, I can, it’s MY blog 🙂 Call it creative license!) Anyway, I digress…back to the pics! I’ve also made some more progress on my courthouse steps blocks some on my lunch breaks. I mailed my cousin’s quilt today, and said prayers that it makes it to them safely. That was hard to do, let it go off like that without me along to protect it. I’ll be so glad when I get a call that it made it! And that wraps up my Wednesday report. Have a great rest of the week! That is so pretty Randi. I add that panto to my wish list. That’s fabulous! I feel a wholecloth of Fantasia coming on. That is just gorgeous– the top and the quilting. Can you let me know where to get the pattern? Is it a PITA to do? I just LOVE that! Thank you for your comments! Brenda, the pattern is in Leisure Arts Quick Method Liberty Quilts book. I just did a quick search, and some came up on Amazon, so I know that it’s still out there. I bought the book at Walmart right after I started quilting. I started this quilt right after that. It was 1998. But PITA to me might not be PITA to you 🙂 Eleanor Burns also has a similar one, in a Quilt in a Day format. I haven’t seen the pattern, so I don’t know if it would be easier or not, but I’m curious. looks great randi….both the quilt and the panto. The log cabin looks great. That panto adds lots of lovely movement to it. I have it also! Can’t wait to see it all done! 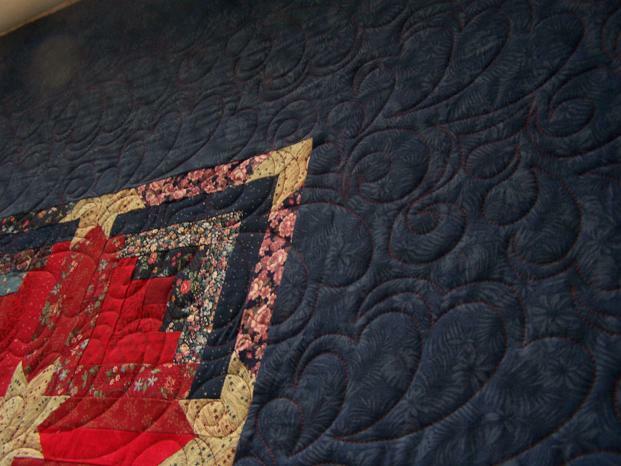 The quilts are wonderful… and I love the quilting on that starry log cabin. It sets the design off perfectly. That’s some stash you’ve got there! Doesn’t it feel great when you make a little dent in it? I keep thinking I’ve got to just make some easy quilts simply for bedding. yeah, right…. Ronda, thanks for the feedback on Eleanor’s. I figured it was probably easier than this version. I’d love to see that wallhanging! 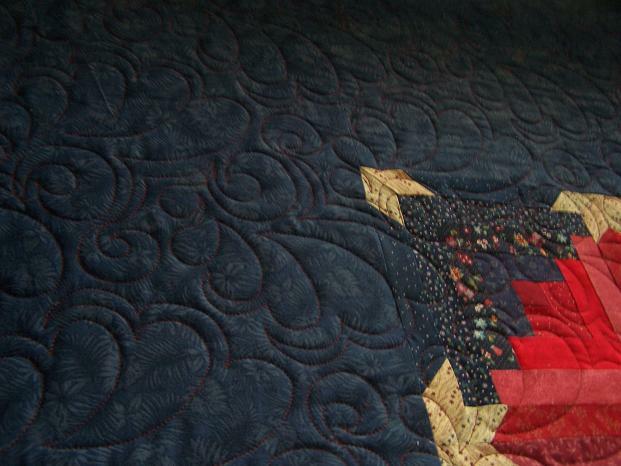 Lovely texture in your quilting!! I also made one from E. Burns, too. Easy peasey! !